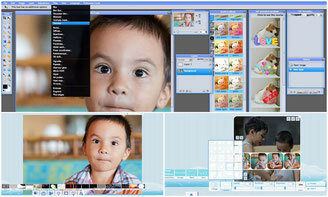 All in one free online photo editors and digital image editing suite and studio. 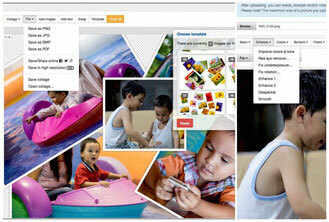 Free online photo editor suite and full studio image editing websites. I consider a Full Photo Editor Suite an all in one free online website photo editor which propose at least all of the five photo editing modules or image tools listed below and photo functions on the same website. 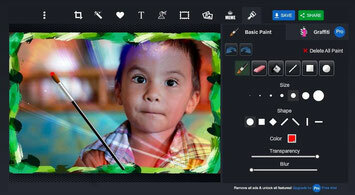 A good basic or advanced photo editor with brushes. A photos collage, images mixer, photo montages or possibility to do canvas, design cardboard and cards. Some very good quality filters and creative photo effects. A good or advanced writing function on a picture (because a lot of people want to watermark their pictures at the same times they are editing). Possibility to add frame borders and stickers or to draw. If one of the above photo editing option is not met by an all-in-one free online photo editing website, it will not be listed here (but listed in one of the rubric on the right side menu). 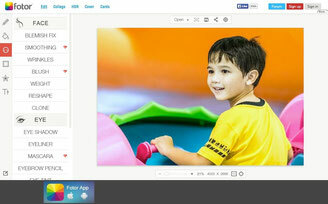 1) BeFunky free picture online editor Suite. 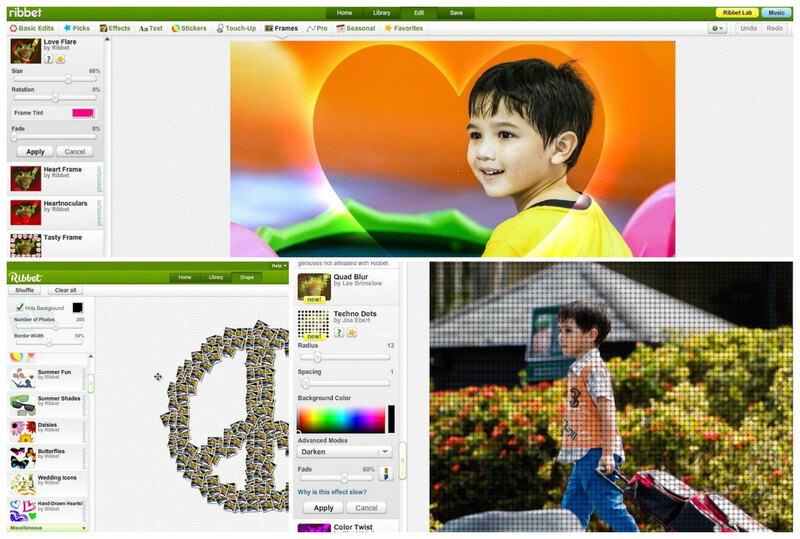 The listing of what can do with Befunky is quite impressive, but the most impressive is, its very simple and very user friendly interface. Edit and adjust your photo. Face, skin and makeup or touch up. Photo collage and picture combine. Design canvas for greeting cards and so. Apply effects and filters on pictures. Add frame borders, stickers and so. Write and watermark your pictures. 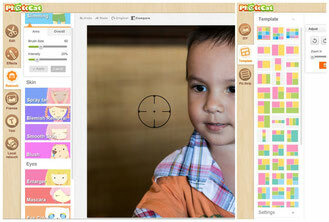 2) iPiccy is a full free online photo editing suite. Photo collage and image combine. Face and skin makeup and touch up. Edit and adjust your pictures. Design, greeting cards and canvas editing system. Apply special effects and filters on your pictures. Add stickers, frames and borders. 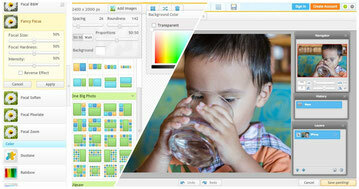 3) Pixlr a complete and comprehensive full photo editor suite. Pixlr is composed of many modules like the collage modules, the photo express module, the photoshop look alike module and so on, making Pixlr one of the most powerful free photo online editor suite on internet. Pixlr might have the most impressive number of high quality overlay, layouts and filters effects, and like the usual high quality standard photo editing suite, Pixlr is very easy to use too, due to it's simple but very effective user interface. Edit and adjust a photo. Has a complete photoshop alike module. Photo collage and image mixing. Add stickers and frames borders. 4) Lunapic free online photo editor suite, GIF animation. Lunapic editor will resize your photograph at what you see on the screen (mine was resized at 2355 pixels vertically for a portrait orientation picture) but adding some filters can even resize your picture smaller. This photo editing website have plenty tools, filters, borders, effects, it does animated GIF and surprisingly video too. I found the UI very old "fashion" like it was made 15 years ago. I have some mixed feeling with Lunapic, on some side it look cumbersome, and in over hand it can be user friendly. For example the resize tool is a nightmare, there is no constraint or ratio option and at the end your picture might look like if a hammer has fallen on the top, but on the over hand you got some nice and specific effects with some tools or some freedom with the collage which is quite unique. Photo collage and mixed images. Draw and paint on your images. Add stickers, text and watermark. Upload needed, and each effect re download the picture. 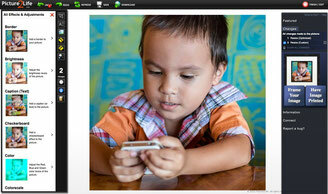 5) PicMonkey free photo editing suite web based. PicMonkey is a very good and complete photo editing suite. It has everything you need from the makeup for the skin and faces, to plenty of frames and borders, special filters and effects, texts, overlays, textures and more. Picmonkey has also photo collage, picture touch up and canvas for design! PicMonkey can save your work at the original size of the photo which is great if you want to print a big picture. It's user interface is modern and well organized. Photo editing and image adjustment. Collage with your pictures and photo mixing. Face and skin touch up, with photo makeup. Add watermark and text on your pictures. Add stickers and overlay with special photo effects. Add frames, borders and textures. Design module with canvas and templates. No upload needed and save at the original photo size. 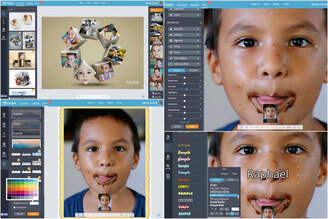 7) Ribbet free online photo suite editor. Ribbet at first will resize your picture to around 3000px wide, which is OK even for a nice print. You need to upload your picture which can be a bit painful if you have a slow internet connection specially with the collage. Ribbet has 2 kinds of photo collage, the classic photo collage with template and the shape photo collage where your pictures will follow any shape you want, even a writing shape. Ribbet editor have all the basic editing tools, a huge load of stickers, effects, frames and borders, a "Pro" side for more editing tools, texts effects, and more. Photo collage and image mixer with shapes. Face and skin touch up with makeup. Add frame border and stickers. Upload needed, but Ribbet recall your upload so no need to upload again. 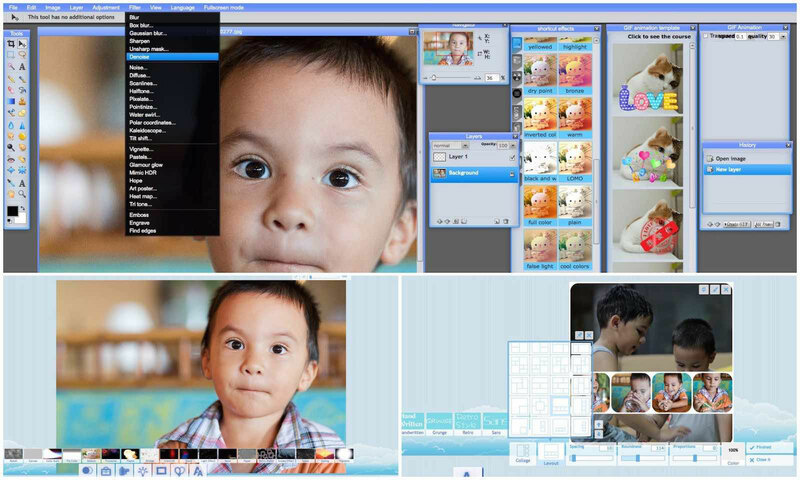 8) PhotoCat free photo editor suite online. PhotoCat is a little but fully capable photo editing suite with full retouch and makeup like mascara, skin tanner... and deserve to be more welknown. 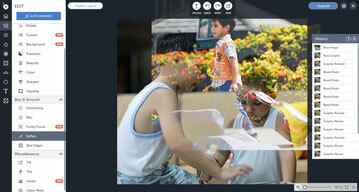 Photocat has plenty of effects and local adjustment tools. Photocat has even a slimming brush to slim people and make them look better if they are a bit fat. The photo collage is limited at 9 pictures maximum, it has plenty of template and you can do your own collage if you do not like the templates. Makeup, face and skin care touch up. Watermark and text on your picture. Special effects and local retouch. 9) Pho.to : A free web-based photo editing suite. Pho.to has a face retouching module where you can fully automatize the face and skin touch up. Photo.to if it is a free online photo editing suite is clearly oriented with photo montages, borders and image effects. In fact it have more than ... 600+ effects and layouts, it is impressive! Watermark and text on a picture. Simple collage, but big library of photo montage. Calendar, greeting cards and animated GIF. 10) Free Online Photo Editor photo and image editor web-based. FreeOnlinePhotoEditor is more aimed at beginners and social media. Freeonlinephotoeditor is composed by FreeOnlinePhotoEditor for pure photo editing, Glitter photos for animations, texts and many other special effects, and Photo collage for your collage with a full control on the position and size of the different pictures, or use the templates offered by the website. All those edits are shared between few websites than can transfer your photo from one to another, to form this photo editing suite. Photo collage, mixed images and photo combine. 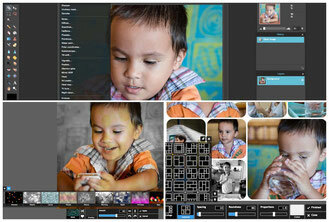 11) Fotor free online collage, editor and special effect. Fotor : No support for RAW photos, max size picture is an 8 Mega pixels photo, which already i feel limited, i mean ... Seriously ? Height Megapixels only ? But you have the option to download and install the Fotor free photo editing software on your computer to not be limited by the size (and it handle RAW very well). This photos editor can do covers and cards with your images too. Fotor is a very good website for beginners to advanced photographers and offer some very nice tools with full control like the photo collage. You can even change the color of the user interface by clicking on the half black and white square at the bottom left. Edit and enhance a picture. Photo collage and photo stitching. 12) Picture2Life online editing application, text and photo effects. Picture2life is well made, it is not ergonomic but has plenty of tools. Picture2Life is more aimed at beginners and advanced photo editing, it is very often updated with new photos editing tools or overlays. You can save only at 1600 pixels at the widest side, and you need to upload your photo, no need to say that each action take time to download what you did when you click on "apply", it's the big downside when it's the server which is processing your picture. Edit and enhance a photo. Textures and one click monochrome (any color). 13) Pizap free online photo editing suite. Pizap is fully loaded with surprising editing tools, special effects, very high quality stickers and more. Pizap let you save the final masterpiece at 2500 pixels at the widest side. Aimed at the beginners this photo editor as one but not the least disadvantage which is the little window as a user interface, lost in the middle of the browser. I just don't understand why the developers of this website did not use all the place given by the web-browser, instead to let us with this tiny user interface. Paint and sketch with brush. Work with layers and image transparency. Add stickers and text to watermark. 14) Toolpic free online photo editing suite. 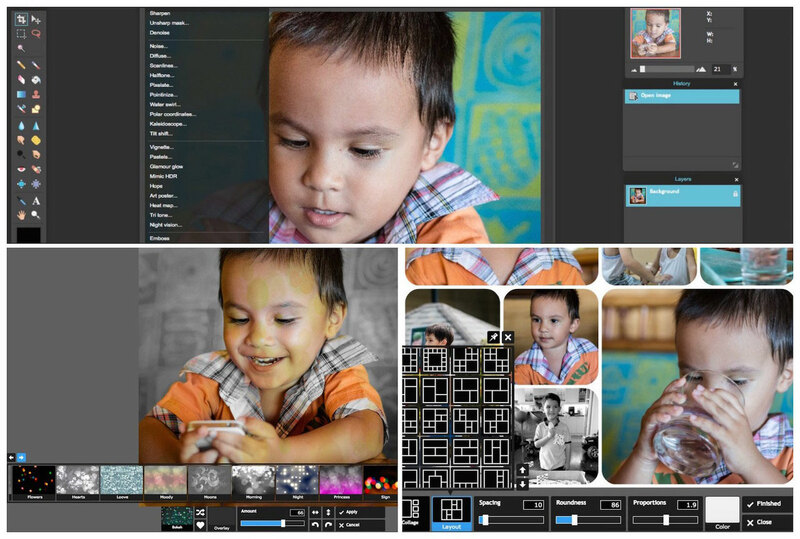 The Toolpic photo editing suite is composed of the main editor, which is Toolpic Editor and Toolpic Magic where you will find a lot of one click photo effect and layout. It's with Toolpic Magic that you will do your photo collage, although you can do it manually with the main photo editor. 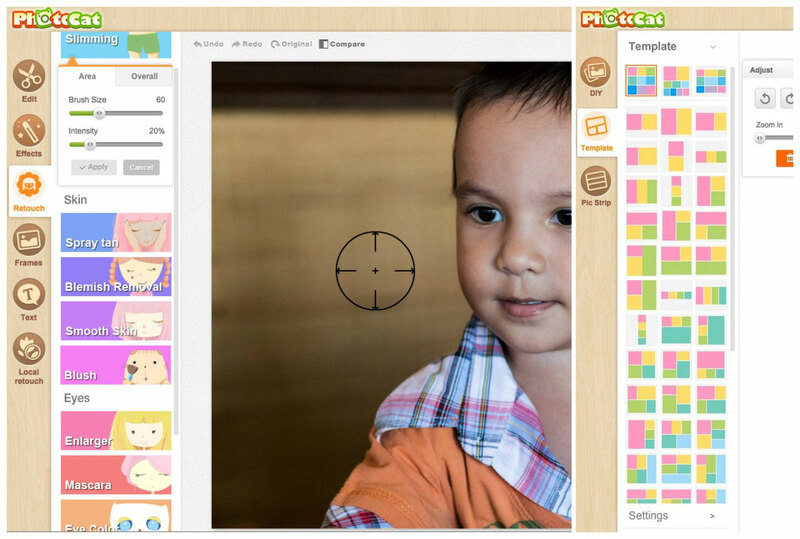 15) FotoJet free online photo editing suite. 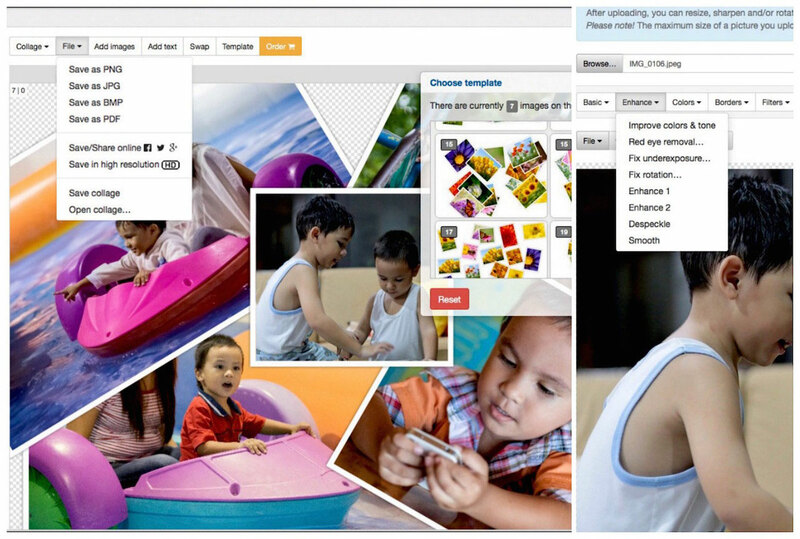 The Fotojet free online photo editor website is already very well known for its collage and the huge choice of beautiful templates that Fotojet offer (even 3D collage templates). Fotojet has a design part to make cards, cardboard flyers and so on, but recently Fotojet added a true photo editor already well featured with gradient and radial filters among other useful photo editing tools it already has. Edit and adjust a picture locally with radial and gradient filters. Add some photo effects and layouts. Add watermark and texts on a photo. Photo collage and image mixing with 3D templates. A special design interface to make cardboard and flyers.